PHOTO BY RON HEERKENS JR. David Andrew Macdonald and Monette Magrath in Geva's production of "Private Lives." 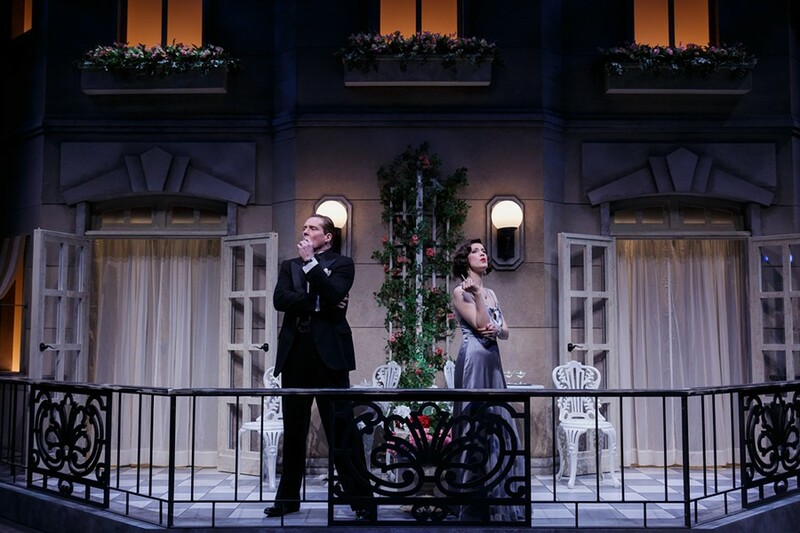 Noël Coward penned his hit play "Private Lives" in less than a week, yet more than 80 years later the show remains a crowd-pleaser in theatrical seasons around the world. Through April 16, Geva Theatre Center is staging "Private Lives" on its Wilson Stage. Coward -- who also wrote "Hay Fever" and "Blithe Spirit" -- was something of a Renaissance man, often acting in and directing his own plays. His original song, "Some Day I'll Find You," was written specifically for "Private Lives" and became one of his most popular compositions. Because Coward, an Englishman, lived much of his life among high society, his work focuses on the European upper class. "Private Lives" is a comedy of manners in the same vein as "The Importance of Being Earnest," characterized by witty one-liners, feisty characters, and a rather absurd plot that masks serious underlying social commentary. It follows Elyot Chase (David Andrew Macdonald) and Amanda Prynne (Monette Magrath), a divorced couple who end up honeymooning with their new spouses, Sybil (Jenny Leona) and Victor (Bill Christ), in adjacent hotel suites in France. When the Elyot and Amanda meet on the hotel balcony, they realize a five-year absence from one another has kindled, rather than dimmed, the flames of attraction. The roles of Elyot and Amanda are somewhat iconic and have been played by stage and film heavyweights like Richard Burton, Alan Rickman, Elizabeth Taylor, and Maggie Smith. Because so much of the show relies on the interaction between the divorced couple, it's important they have a convincing relationship. Fortunately, Macdonald and Magrath are a splendid match -- they're married in real life. The two have a natural onstage chemistry, and much of the humor throughout the play is based on their tête-à-tête. Magrath plays a sassy, magnetizing Amanda, and Macdonald embodies the charismatic, spontaneous Elyot. As the unfortunate newlywed spouses of the leading pair, Leona and Christ do an admirable job. Leona plays the young, naive Sybil but reveals a more complex side near the end of the show; while Christ is the older, gruff-yet-caring Victor. Both actors get their fair share of laughs, even with considerably less stage time. Rounding out the cast is recent SUNY Brockport graduate Alexis Russo, who plays Louise, a sickly Parisian maid. Through sneezes, sniffles, and surprisingly polished bits of French, Russo capitalizes on her limited role. Mark Cuddy directs, with each humorous moment played to its fullest potential. The set design by Nicholas Dorr is full of eye candy, from an ornate hotel balcony in a resort town to Amanda's luxurious flat featuring gold-trimmed details and plush furniture. The only thing missing from the technical side of the show was a more thorough sound design: on the hotel balcony, especially, ambient evening sounds would have enriched the scenes. The repeated inclusion of Coward's song, however, helped to fill the gap (and gave an emotional linchpin for Amanda and Elyot's characters). Costumes by Gregory Gale are sumptuous. "Private Lives" is a seductive, rollicking romp. At its core, the story is so rooted in human nature that it doesn't feel stale or irrelevant, and the nostalgia of the 1930's setting makes it all the more charming.